nationwidedistributors has no other items for sale. Item arrived as described and transaction was smooth! Love this game and the price was right. Deliver was on time and pkg was new. Item as described fast and friendly great communication thanks! A+++ Seller! Good communication and the game arrived sealed, as described! Came sealed, but make "not for resale" condition more visible in listing! Never received the item. Never heard from the seller, even after reaching out. Charged to much for the game as it dropped in price, seller refused to refund!!! Slow to respond. Refused to match a better price after they already took money. Longer than expected arrival. Placed order 11/19. Seller communicated well. Big box seller is very slow to respond to contact about immediate concern. Game has been opened & rewrapped. Book is missing. Game was loose in case. Almost a week later and I have yet to receive the item I ordered. Shipping isn't placed, while the seller didn't contact me until I found out. Product did not come on time. Game was ordered Nov 18 still had not received by Dec 10th. This game is everything you could hope for. Unlike GTA, you don't get overrun with side missions, and you have time to complete them when you want to. I am blown away by this game! In my 40 years in gaming, I'm finally impressed with a super hero game!Make More! AMAZING!!! Thank you!! My husband rented this game and loved it. He said it had a great story line and kept him interested. So I found it for a great price here. He is going to love his Christmas gift! It everything you'd want from a Spider-Man game. There are some slower stealth sections that is hit or miss but the AI is super dumb so they aren't hard or frustrating. 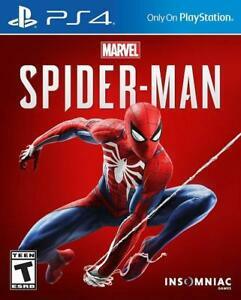 The visuals are great, the story is good (especially the dialogue), the combat is satisfying, and the web-swinging is fun. Really the web-swinging is the best part of the game. Trying to move around as fast as possible is a game in itself and not once did I choose to fast travel. Overall it is a good time with plenty to do. Its an awsome game with outstanding graphics. The fact that you can go in around the city in a free mode is a big improvement.